Home › External Newsletter › Revival of a cancelled space mission? The characterization of habitable or even inhabited exoplanets is one of the ultimate goals of modern astrophysics. Reviving the concept of a space mission that was cancelled ten years ago would be most promising. This is the conclusion of a paper by PlanetS scientists Jens Kammerer and Sascha Quanz of ETH Zürich. 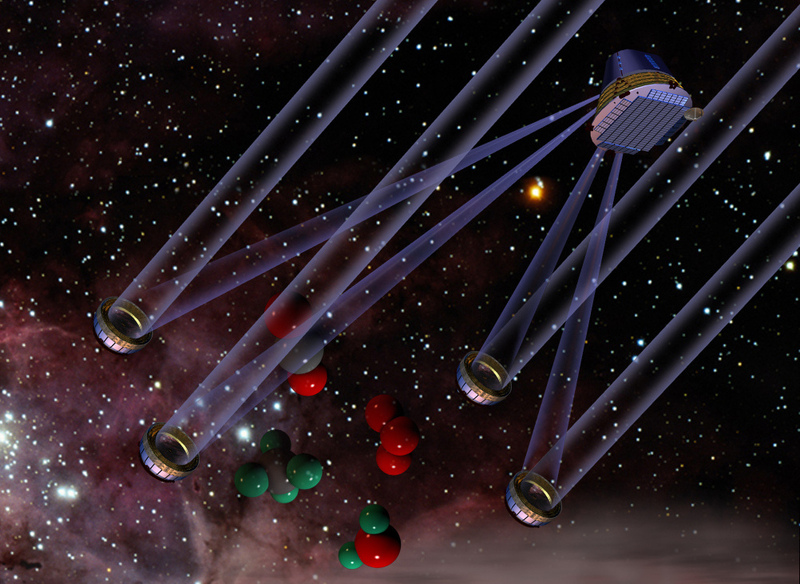 Their simulations show that a space-based mid-infrared interferometer could directly detect more than 300 mostly small, nearby exoplanets. What if ESA had actually launched its space mission called Darwin, a constellation of four or five free-flying spacecraft designed to carry out high-resolution imaging of earth-like exoplanets? This was the question that ETH senior staff scientist Sascha Quanz and his master student Jens Kammerer wanted to answer in a study now accepted for publication in the journal «Astronomy & Astrophysics». «We showed that the mission could have directly detected more than 300 exoplanets – considerably more than all the currently planned direct imaging projects will ever find,» summarizes Sascha Quanz. For their study, the researchers simulated thousands of exoplanetary systems around 326 nearby stars. The simulations were based on data from NASA’s Kepler mission that provides, for the first time, robust statistics for the occurrence rate of exoplanets as a function of their size, orbital period and stellar host type, revealing that small-sized planets are ubiquitous. More than 10 years ago, when ESA and NASA were working on possible designs for a mission to search for such small, earth-like planets, much less was known about exoplanets and because of technical and financial problems the projects were abandoned. «The designs were indeed complicated and challenging, but a lot of progress has been made and some of the technical problems are now solved,» explains Sascha Quanz who took a new look at the former concept of a so-called space-based mid-infrared nulling interferometer. Working at mid-infrared wavelengths means detecting the planets’ thermal radiation as opposed to reflected stellar light. The term «nulling interferometry» refers to the technique that is used to cancel the bright light of the star to be able to image a much fainter planet. The interferometer consists of different, precisely aligned telescopes and a central hub. The starlight reaching some of the telescopes is delayed before being combined again at the hub. This causes the light from the central star to interfere and cancel out. Radiation from a planet, however, is already delayed between one telescope and the other since the planet is located offset from the central star. By delaying the radiation of the planet a second time, the combined beams are reinforced rather than cancelled out. Kammerer and Quanz calculated that slightly less than half of the planets that could be detected by the simulated space-based mid-infrared nulling interferometer orbit red dwarf stars, such as Proxima Centauri or TRAPPIST-1, which also have the highest planet yield per star. The other half orbit stars similar to our Sun. Most interestingly, however, 85 planets could potentially be habitable or even inhabited with radii between 0.5 and 1.75 times the radius of Earth and effective temperatures between 200 and 450 Kelvin (-73 und 177 Celsius). These should be prime targets for spectroscopic observations and in-depth characterization in a second mission phase. With their study the researchers want to reinitiate the discussion about a large space mission dedicated to find and characterize earth-like planets. «The findings from Kepler have taught us that moving forward with Darwin would not have been in vain,» they write: «A space-based mid-infrared interferometer mission seems to be a very promising concept.» Sascha Quanz is convinced that a coordinated attempt from within the exoplanet community speaking with one voice would be a viable way forward.